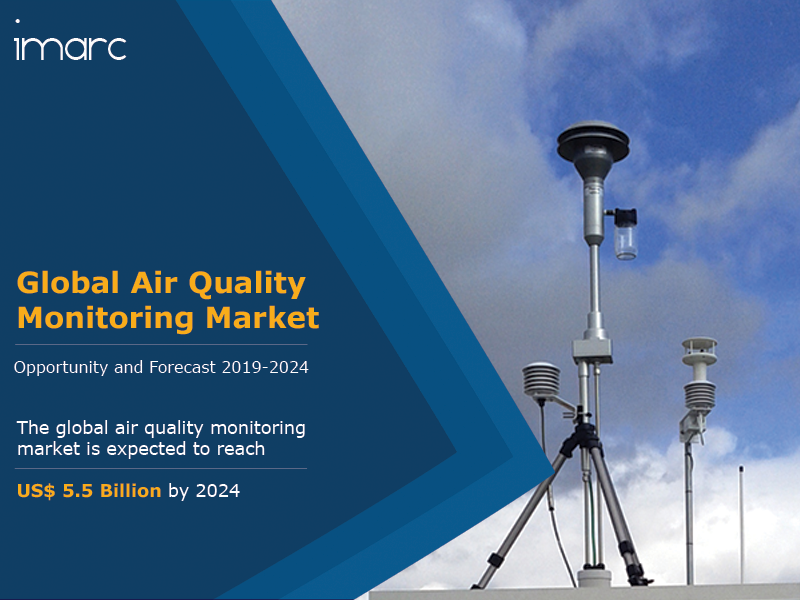 The global air quality monitoring market reached a value of US$ 4.1 Billion in 2018. An air quality monitor refers to a sensor-based instrument which is used to detect and monitor the levels of pollutants, such as sulfur dioxide, nitrous oxide, carbon monoxide, particulate matter and volatile organic compounds, in both indoor and outdoor environments. On account of escalating levels of harmful emissions from vehicles and industries, a large part of the global population is at high risk of developing breathing disorders like asthma, and diseases such as lung cancer and chronic obstructive pulmonary diseases. The rising awareness among individuals and governing authorities about the adverse effects of air pollution is strengthening the demand for air quality monitors worldwide. Several industrial facilities emit pollutants during their daily operations which causes a severe impact on the environment and the health of the people working on the premises. They depend on air quality monitors to examine dispersion, dry deposition and chemical transformation and monitor deviation from the air quality standards. Moreover, governments across both developing and developed markets are undertaking initiatives to make industrial operations more environment-friendly. They are also implementing strategies to monitor and improve the overall air quality which, in turn, is impelling the growth of the global air quality monitoring market. Further, manufacturers are investing in research and development activities to develop and launch products and technologies. For instance, they are introducing low-cost as well as portable air quality monitors to widen their consumer base. Looking forward, IMARC Group expects the market to reach a value of US$ 5.5 Billion by 2024, registering a CAGR of around 5% during 2019-2024. How has the global air quality monitoring market performed so far and how will it perform in the coming years? What are the key regional markets in the global air quality monitoring industry? What is the breakup of the market based on the pollutant? What is the breakup of the market based on the sampling method? What are the various stages in the value chain of the global air quality monitoring industry? What are the key driving factors and challenges in the global air quality monitoring industry? What is the structure of the global air quality monitoring industry and who are the key players? What is the degree of competition in the global air quality monitoring industry? What are the profit margins in the global air quality monitoring industry?